Osborne Painting will restore and revitalize your deck with our quality and guaranteed deck refinishing services. A dingy deck doesn’t mean you have to rebuild it. Instead, contact the Raleigh deck refinishing experts to restore your deck as good as new. Be sure to check out our deck refinishing and staining frequently asked questions blog article to gather a better understanding of roadblocks and deck revival details. Osborne Painting has been serving the Raleigh and surrounding areas for over 20 years. Our deck professionals are experienced and well-versed when it comes to pressure washing, cleaning, painting, staining, and sealing your deck to its near original look and extend your deck’s life for years to come. We truly believe that all decks deserve to be maintained as well as possible, whether your deck is regularly used for cookouts and get-togethers, or if it is just used as a sanctuary for your dog. There are many different ways to revitalize your Raleigh deck, although almost all of them start with some quality power washing and carpentry work. From deck restoration to deck cleaning to deck painting to deck sealing, Osborne Painting’s experts can help you make sure that your deck lasts for years to come. What types of wood do you have experience working with? We have worked with numerous types of wood including but not limited to treated pine, cedar, redwood, and mahogany. If you have a deck built with a unique and not-so-common type of wood, let us know! The process of restoring your Raleigh deck starts with an estimate, covering all the possibilities including necessary carpentry, cleaning, painting or staining, and sealing. 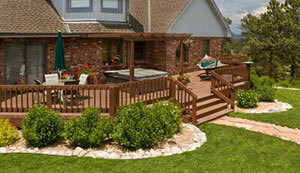 Once you have decided on how you want to restore your deck, our experts will move forward with the restoration. The first step to any good deck restoration in Raleigh is power washing. Due to our humid and relatively warm climate, mold and wood rot are rampant in wooden decks. The first step to dealing with these problems is to thoroughly power wash your entire deck. This will remove any slippery algae or fungus that might have accumulated, as well as removing the dirt and grime that comes with owning a deck. If deck power washing in Raleigh is all you want, the process will end here. If not, however, we can move on to deck painting, deck staining, or deck stealing. Many people prefer to leave their decks plain wood and seal them, but for those that do not Osborne Painting offers deck staining in Raleigh. For deck painting, we will use the same techniques that we use for our home exterior painting services. Our painters use primarily hand brushes as to seal the wood against moisture and environmental damage. We will work with you to decide which color would work best on your Raleigh porch. Osborne Painting also does deck staining in Raleigh. If you believe that your deck would look better stained than painted, our contractors will work together with you to decide the color of the stain, apply it, and make sure that you’re happy with it. We use stains that make certain that your Raleigh deck will look good and protect your deck for years to come. Which deck stain lasts the longest? A deck stain product’s durability varies case-by-case. Keep in mind, a stained deck should be maintained well and can easily be neglected. While many people prefer to paint or stain their decks, some prefer the look of wood and wish to merely seal their decks against the elements. Our deck refinishing process makes sure to insulate the wood of your deck against the often-damp weather in Raleigh, guaranteeing a longer deck lifespan and less necessary maintenance than an unsealed deck. How do I know deck seal is the best option for my deck? As part of the Osborne Difference, we take pride in educating our customers and prospective customers as well as we’re able to. If you have any questions regarding deck staining and deck sealing, let us know so we can provide insight!